Building a second story addition onto your home is not an easy or inexpensive endeavor. It means removing your home’s roof, beefing up the existing home’s framing structure, putting your home and personal belongings at risk of damage, and uprooting your family for several months. However, for all of the concerns just mentioned, adding a second story addition may be your only choice if you don’t want to sell your home, and you don’t have the lot size to build an attached home addition onto the side of your home. Though building a 2nd story addition is more expensive to build than and attached room addition, second storey additions typically are less expensive than the total costs of selling an existing home and purchasing a new one. When switching homes, a homeowner has to consider the cost of the commission on selling the home, state real estate transfer taxes, moving expenses, bank closing costs, and the cost of turning off and turning on new utilities. When all those costs are factored in, they typically add up to tens of thousands of dollars. So though a adding a second story addition onto a home is an expensive and difficult endeavor, it is often a lower cost option than moving. It’s just that second story addition costs are higher compared to building an attached home addition. 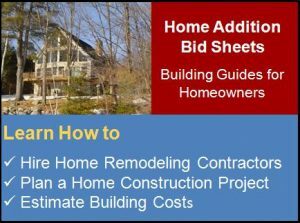 Building a second story addition has a set of unique construction costs associated with it that make it more expensive than a typical bump-out home addition. First, the demolition work is extensive, as the roof has to come off. Second, additional construction material, e.g. lumber and concrete, are commonly required to strengthen the existing home. Third, preventive care is needed to protect the first level floor and its contents, e.g. large tarps acting as temporary weather protection for the first floor.Fourth, existing plumbing drain pipes often need to be resized, or doubled, in the house to support the additional living space if bathrooms are included in the second story addition plans. All of these construction cost items add to the overall cost of adding a second story addition onto a home. There are a number of factors a homeowner needs to consider before deciding upon adding a second story addition to their home. First and foremost, there are building codes and covenants to consider that may restrict you from adding a second story addition. So make sure to visit your local building inspector and check your covenant documents first before embarking on a second story extension. Second, there could be architectural limitations with your home that either prevent the possibility of building a second story addition, or make it extremely costly. For example, at a minimum expect that the ceiling joists in your home will need to be beefed up to support the increased load of another floor level. Secondly, even the existing walls of the home may need to be strengthened to support the extra load of the new floor level. Third, there is also the possibility that the foundation walls will need to be reinforced to support adding a second story addition onto your home. All of these items add tremendously to second story addition costs. But it many cases, not all are required to do to build a 2nd story addition. So make sure you have an architect or a structural engineer take a look at your home during the planning phases of the second story addition project. Third, family upheaval is another major factor to consider when deciding upon adding a second story addition onto your home. Due to the fact that the roof of the home has to be removed for adding a second floor onto it, there is no practical way the home can be occupied while the construction work is going on. Consequently, alternative temporary living space will be required during the second story addition construction. 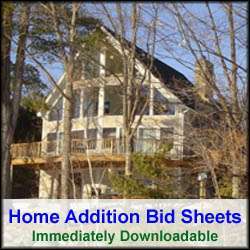 Fourth, it is critical that the right home remodeling general contractor be hired. Great care and attention to detail are vitally important factors when constructing second storey additions. The removal of the home’s roof and any other demolition necessary has to be done in such a way as not to damage the first level floor of the home. Moreover, preventative care is essential to protect the first floor from becoming weather damaged while adding a second story addition onto the home. Thus, it is important to hire a home remodeling contractor that has a proven track record of adding second story additions onto homes. So to summarize, adding a second story addition onto your home is expensive and complicated, but in most cases, it is cheaper to do than selling your home and moving to a larger one. However, building a second story addition requires additional upfront homework, better planning, and more careful construction than the average bump-out home addition. As a result, it is incredibly important to hire the right home remodeling contractor who has a proven track record in building 2nd story additions. To conclude, if you love your home and want to stay in it, but have a growing family and a limited lot size, adding a second story onto your home is definitely a great way to go.